If you remember from this post, I wrote about the type of Farmer's wife I am. I don't know how to drive combine, tractor, or even a grain truck (yet). But I know how to cook, love my husband, tolerate his long hours, miss him like crazy, raise his child, pay the farm taxes, and balance the checkbook. 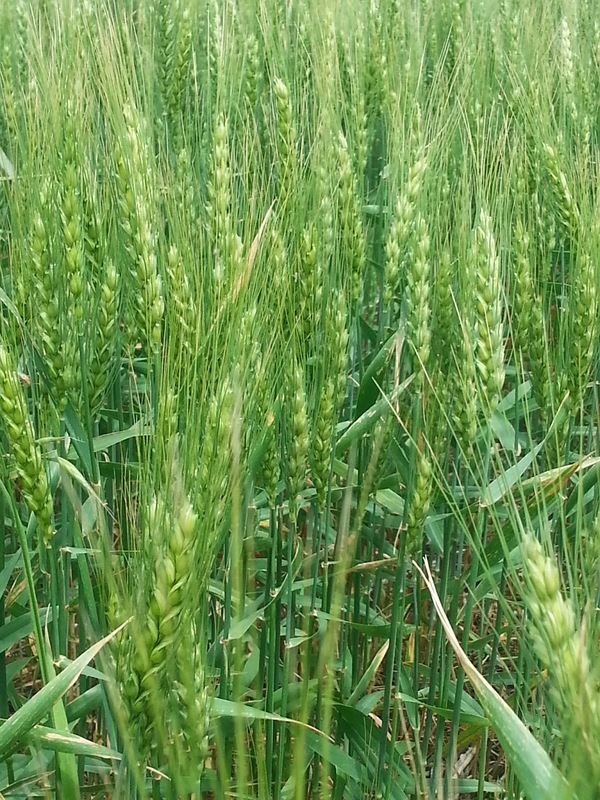 We went by the wheat fields and then headed to the soybean fields. 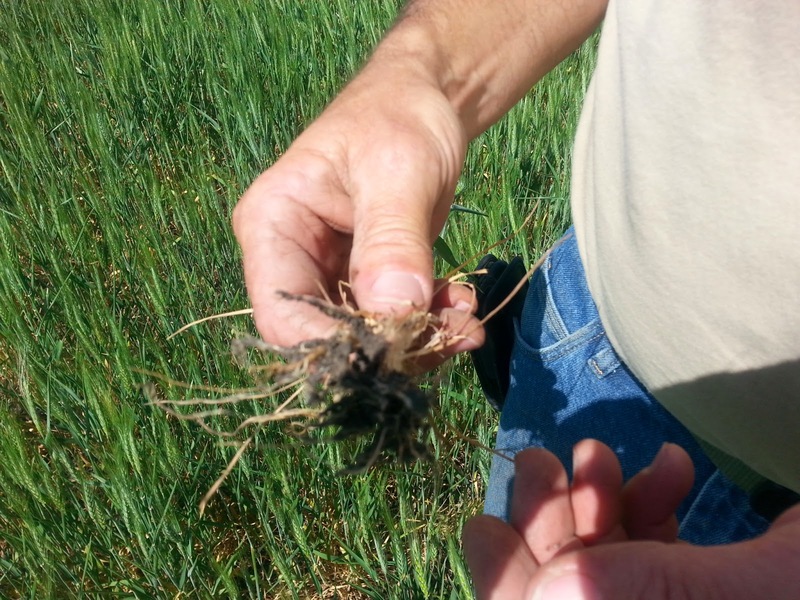 When we arrived at the soybean field, we noticed some of this in the field. 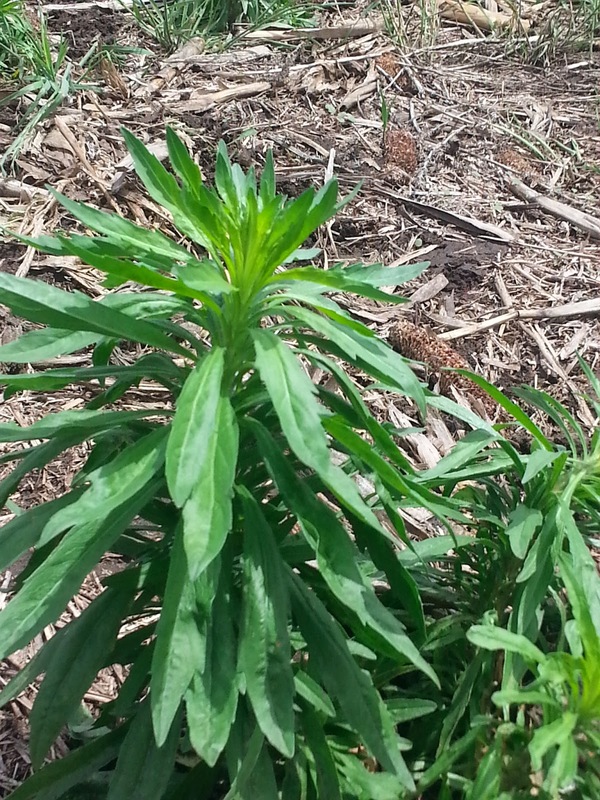 This is Marestail. This is not our friend. This is a weed! 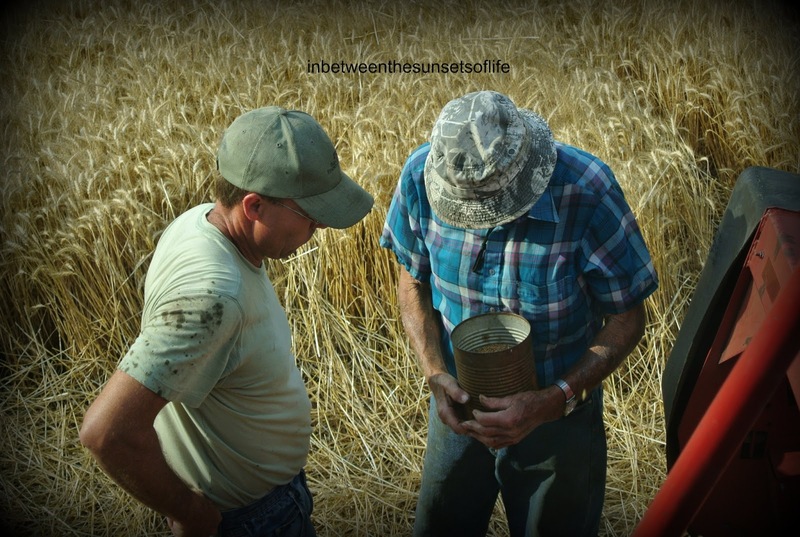 Milton stated that he would have to come back up and pull what was in the field. Well I decided instead of resting and enjoying the afternoon in my air conditioned home, we would just get to work in the hot sun - TOGETHER! Milton and I were on each side of her and he decided to try and put it into terms a six year old could understand. I think he did a great job! He explained to her that the Soybean needs sun, moisture (water), and nutrients to grow. If the Maretail is right next to it, it will take all those things from the Soybean and the Soybean can not grow. He told her that if he stood over her and took everything, that she wouldn't grow. I chimed in and referenced that she was the Soybean and Daddy was the Weed (Marestail). It clicked, she knew what we meant. 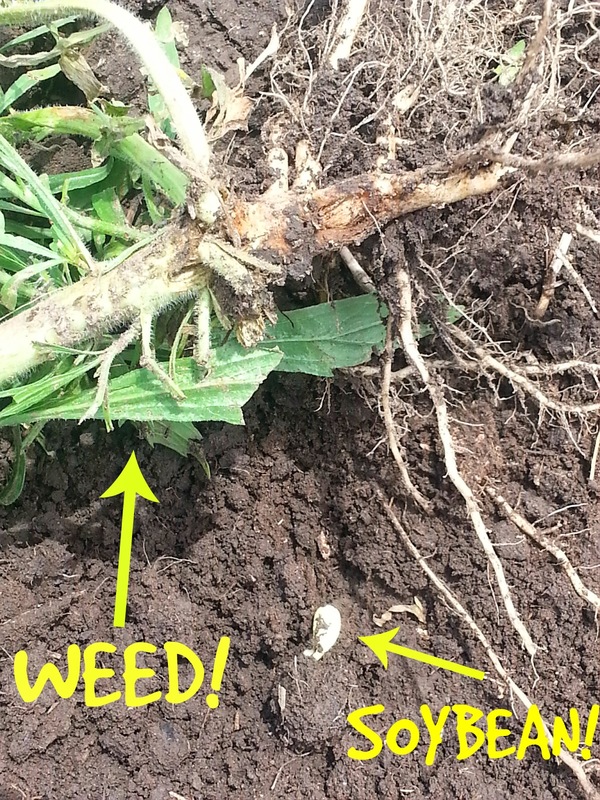 At one point, I pulled a weed and it had a large root on it and it had been right next to a Soybean. So I hollered for PV to come over and I showed her both of them. I reinterated what Dad had explained. I also explained that if the Soybeans do not grow, then Dad doesn't have any or much to harvest, which means we can not sell the Soybeans. She needed to understand that this is how our family makes our living and how we buy things and pay for clothes, trips, our home, food, etc. I also told her that others benefit when we are able to produce Soybeans, and if we don't produce a crop, that means someone may go without. I then sent her over to her Dad so he could tell her what types of things are made from Soybeans. This is what I saw the next time I looked up from pulling weeds in the hot sun! My heart melted and it wasn't from the heat folks! Being a wife and mother is hard work no matter what occupation you are in or what your family does for a living. 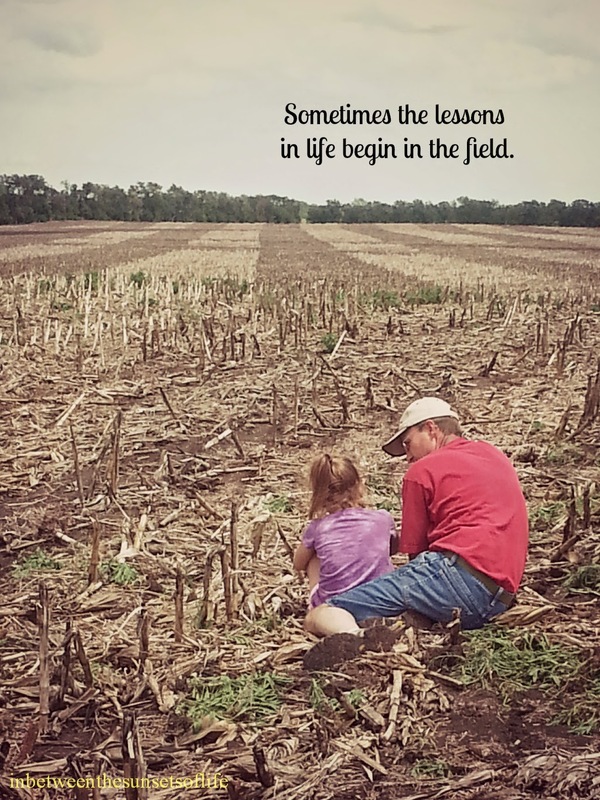 Being a Farm wife and mother bring me many opportunities to live in reality on a daily basis. I'm ok with that, and it isn't like the reality shows on TV folks! My Farm wife duties are slowly progressing and changing with each season. I'm glad about that. I also wanted to mention the entire time I was in this field, I thought alot about my Grandfather Kumle, my Father and Mother. 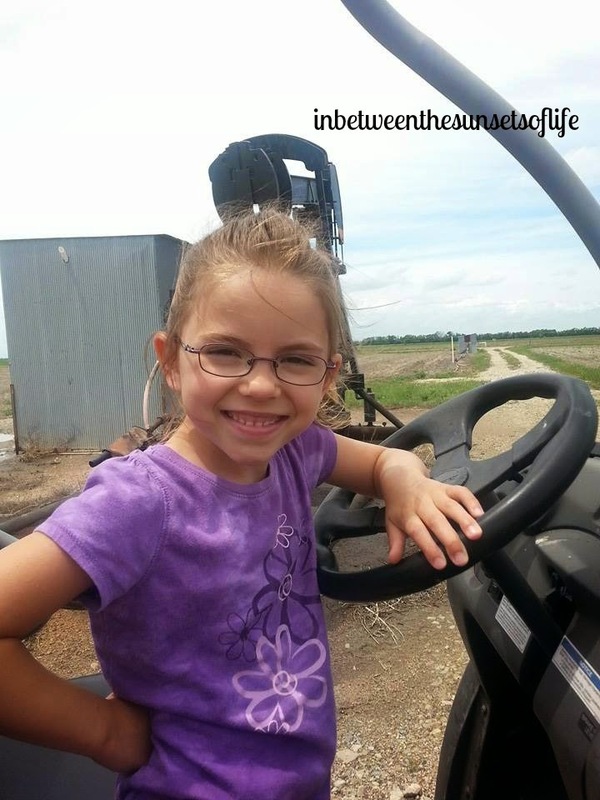 The days when I was very young we lived on a farm and ranching and farming were a way of life. I'm glad that God brought me back to the farm. Thanks for stopping by! I look forward to next time! Last Thursday evening I arrived home to find the farmyard buzzing with activity! The tractor had finally made it home from the repair shop and the soybeans were ready to be loaded into the drill! The skies had opened up earlier that day to give us some moisture! And more was in the forecast! 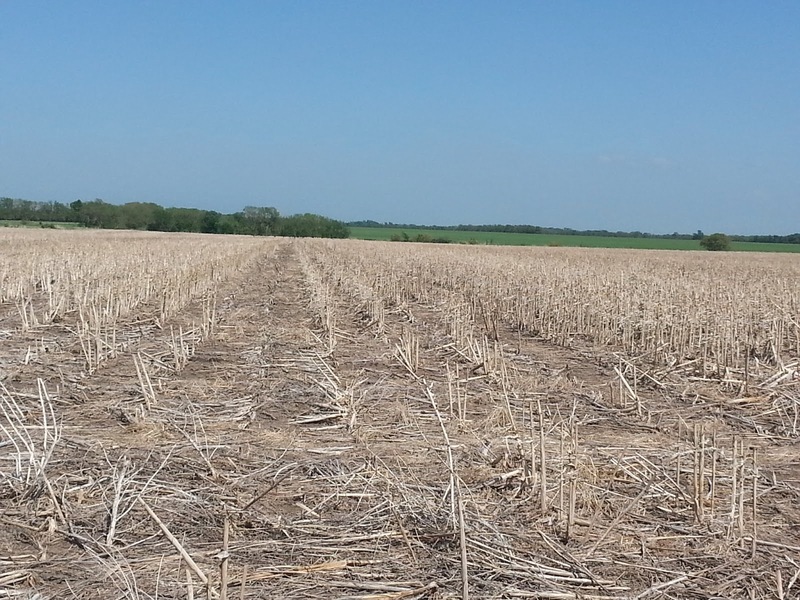 Only one field was dry enough to plant! The drill had been ready to go for a few days and so was the farmer! I love to watch my husband in his element. Recently, he has had alot on his plate with construction sidejobs, farming, and being the father/husband he wants to be. But all the stresses seem to slide away, as he was preparing to do what he loves most. FARM. I don't know if I can put it into words exactly what I see and how it makes us both feel but I'm going to try. First, the way my husband maneuvers a piece of large equipment or truck is amazing to me. He just has a talent, at least I think so. He can park a large grain drill right next to a feed bunk and not hit it or how about when he turns the large tractor and drill around in a small farmyard. 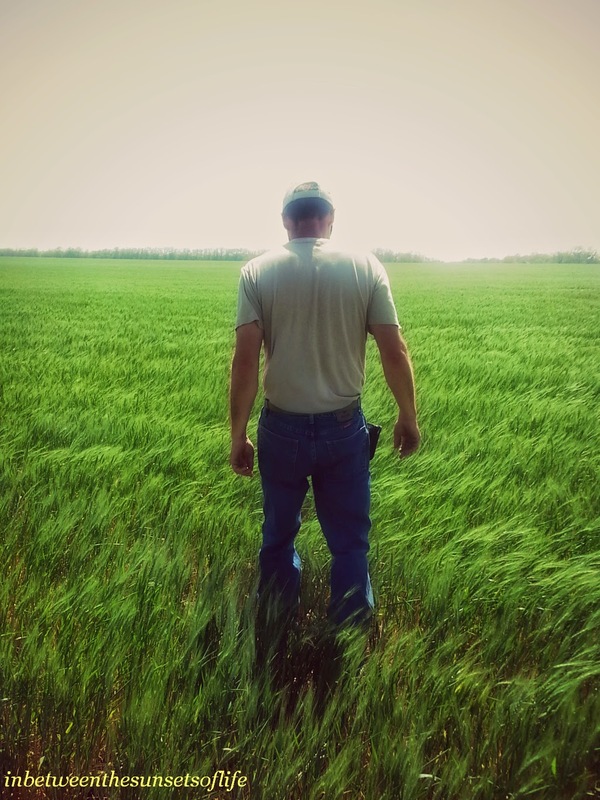 He makes it all look pretty simple, but in reality it's not always simple to be a farmer. I guess it comes from years and years of practice. 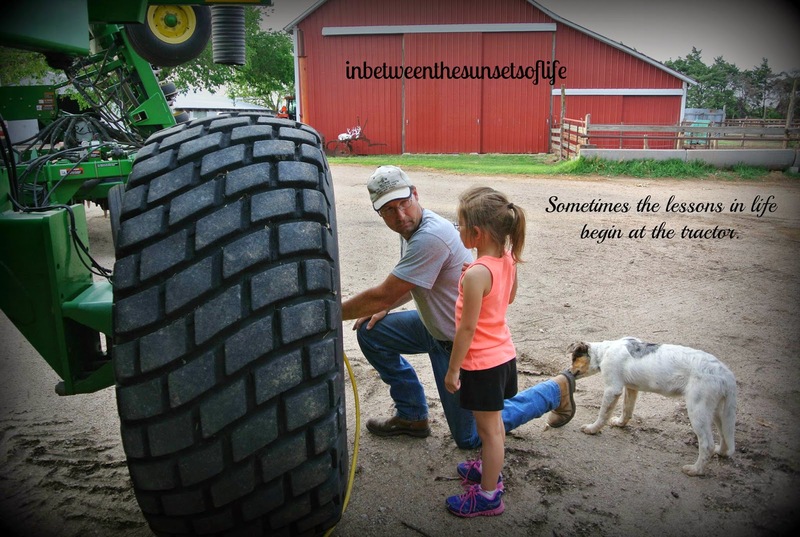 As he goes through each step of preparing to drill soybeans, I watched him not only interact with his father, but his daughter as well. All while keeping his cool and not missing a step. I took this last photo, posted it as our cover photo on Facebook, and it blew up! It was shared (as of right now) 126 times. That's the most activity we have ever had on our page, and I'm grateful. It also gave us more followers which is a wonderful way to share our story and life on the farm! But mostly I am grateful because the photo and words are true. 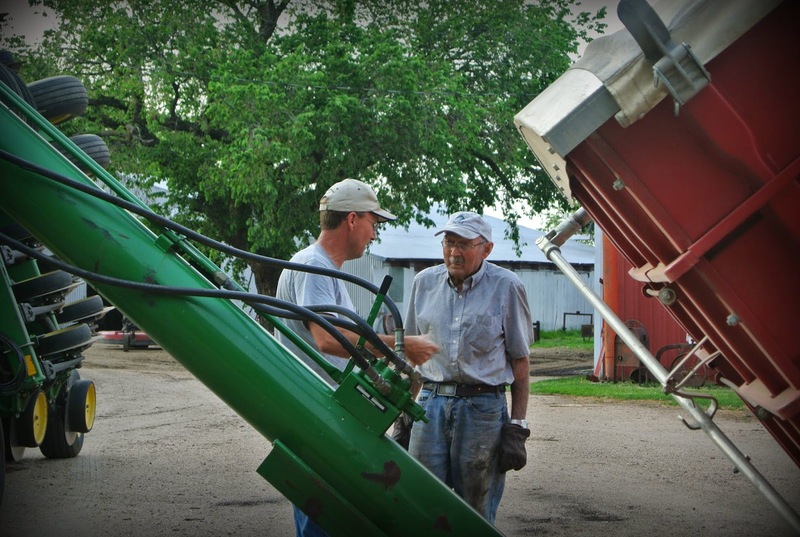 Many lessons are taught and received next to a tractor or drill or combine or in a pickup while checking cattle. They will be passed down for generations. Respect for machinery, animals, and the soil. Safety, values, and conduct being a few others learned. 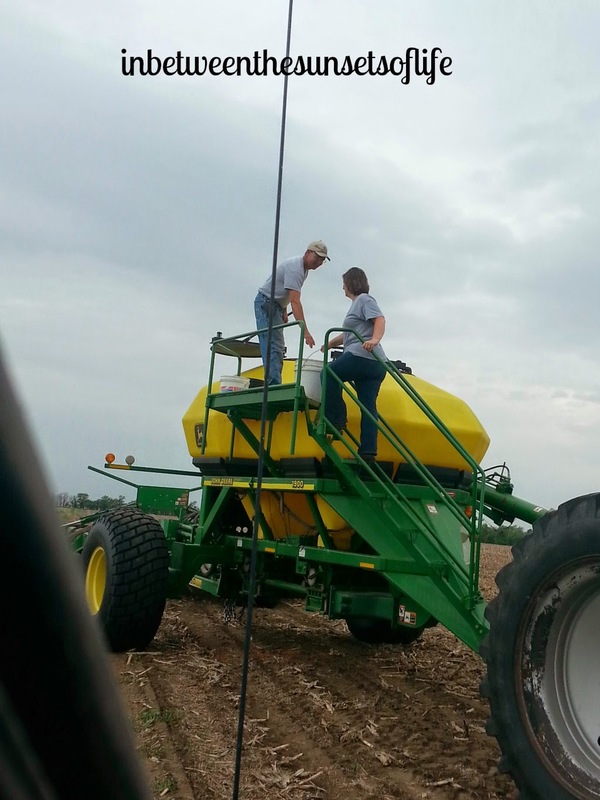 PV played on the drill and surrounding area while her Dad prepared the drill for planting. She likes to go up to the top of the drill and hang out. We took this opportunity for a photo shoot! :) She is hilarious isn't she?? And what farm kid doesn't love popsicles! Milton was able to get some of the soybeans planted. He finished the field the next day. He had to call me as he ran short on soybeans. There wasn't much left to plant, so we decided to get 3 buckets of beans to take to the field. PV decided to snap a few photos while waiting in the pickup! I loved the fact that I was at home and able to help Milton with the farming. That PV got to see us working together. One of my favorite photos from this day is this one. 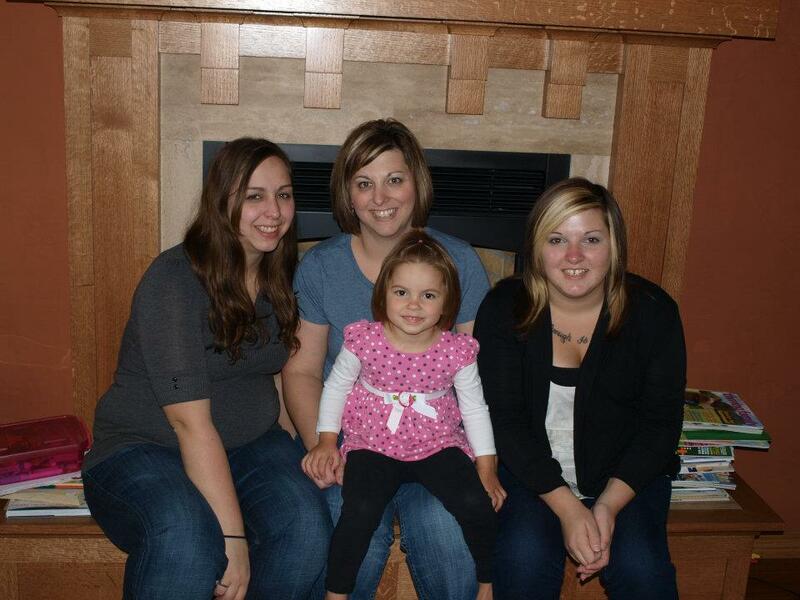 I'm proud to be a farm wife and mother, I'm proud to be raising a farm daughter. Even though this photo was taken at the end of the day, with crazy hair, and hardly any makeup on, it's still special. Special because the smiles on our faces tell it all! We received more rain today and we are very thankful. Although all our soybeans are not in, we are ok with it. We need the rain something awful and either way we know that God will provide for us! When I read this prayer this morning from the Lutheran Prayerbook, I instantly thought of my husband. Perhaps because of the first line about the labor in the heat of the day. I felt it was a beautiful prayer for everyone, whether you farm or not. But today I am dedicating it to all the Farmers and Ranchers out there! O God, we labor in the heat of the day. So often the labor feels hopeless, unproductive, useless. An yet, you hear our silent cries. You give us one another to speak that which we in our pain cannot speak. You give us your Word that utters those things we cannot find the words to say. Not only do you give us the words to speak, but you also turn your ear to us and hear us - even when all we have strength to whisper is "Lord, in your mercy, hear our prayer." For you have promised to hear us. You have promised to turn your face to shine upon us. You have promised to be our shade when the heat of the day snaps our strength and the well of hope runs dry. And you have promised even in the silence, to give us the sweet sound of peace. By John McCullough Bade from "Will I Sing Again? Listening for the Melody of Grace in the Silence of Illness and Loss." 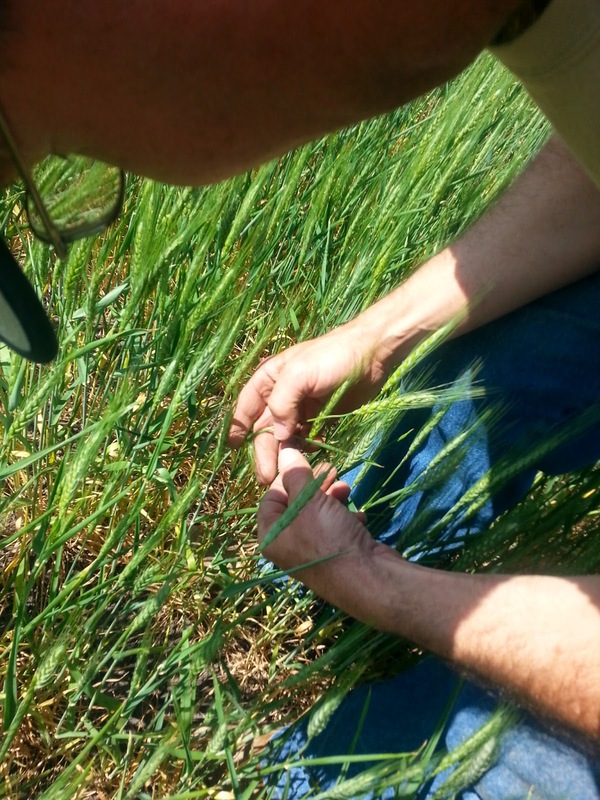 In the past week, PV has attended two wheat tour meetings. She was obtaining valuable knowledge about wheat crops! She did very well at the meetings Milton said. I am proud of both of them, Milton for being willing to take her and PV for behaving. She may be in the minority at these meetings but I think it helps her to know, that at no matter what age, educating oneself is important. At the second meeting, there was a speaker, Jim Shroyer. 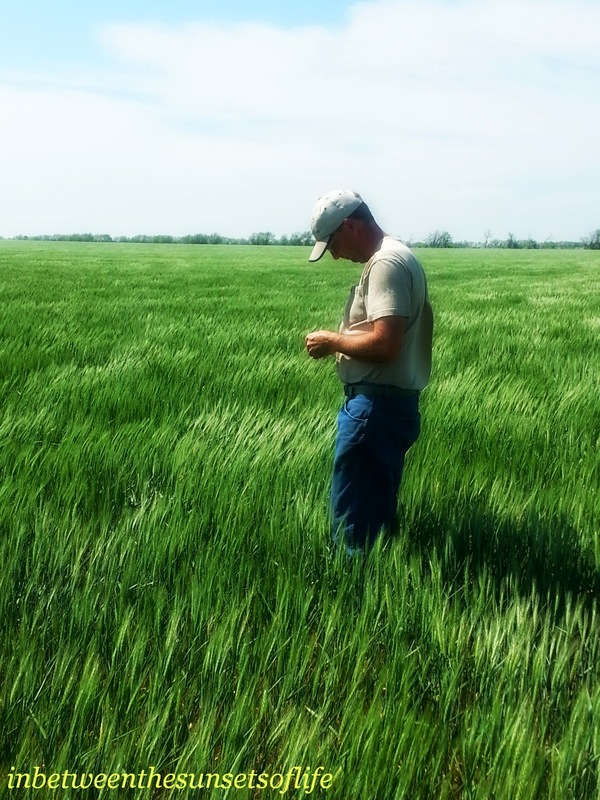 He has spent many years as a faculty member in the Department of Agronomy at Kansas State University. He is also an author. He wrote the following book. PV came home with an autographed copy of the book! I was fortunate enough to get to read it to her last night. I have to say, it really is a good book. It's well written and the illustrations are lovely. The story is one that teaches and also includes a family setting. 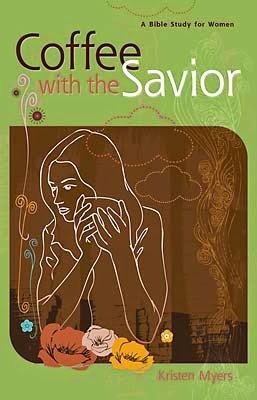 I would recommend this book for sure! In fact, PV even learned things from it. Here on our farm we do not have mother cows and calves. So she inquired about what "nursing" was. So the conversation on how a cow feeds the calf was discussed. I believe it's time to make some visits to our friends farm that has a cow/calf operation! You can find this book at Amazon here. It's $10.00, and I think it's well worth that. I will probably be giving it as gifts in the future. And when he writes more books, I will buy those too! I like the fact that PV's grandpa gave it to her as a gift. It makes it even more special! Weekly Post - Won't You Join Me? Over here at In Between the Sunsets of Life I've decided to tackle a new type of post. It's not totally foreign to me. Yet it's a commitment which also includes I will be opening myself up for growth. I will be posting every Friday. You would probably like to know what the subject is, huh? You have heard me mention how much I enjoy my Monday night bible study group. Our weekly time together started back up again last night after a short break. My weekly post will be based off our current bible study. further in their learning of God's word. I look forward to this and your interaction in the times we get to spend together. He Wants to Have Coffee with Me? please share via email, Facebook, or Pinterest! "mini-date"! We took about 3o minutes to ourselves and inspected the crops! 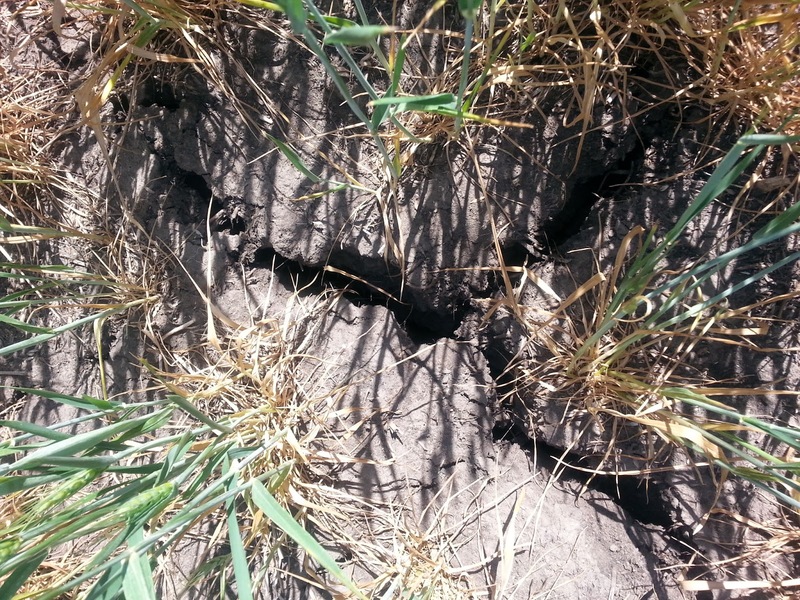 LARGE CRACKS in the ground.... dry weather.. need moisture! 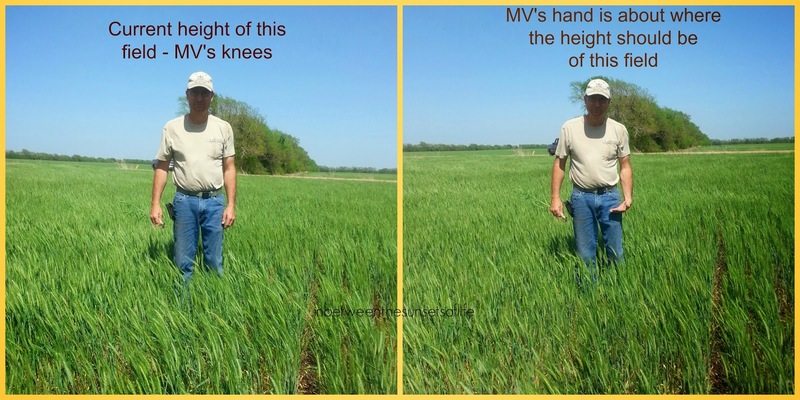 Check out the height of the wheat. By now it should be taller, but with no rain, it's not growing as tall. 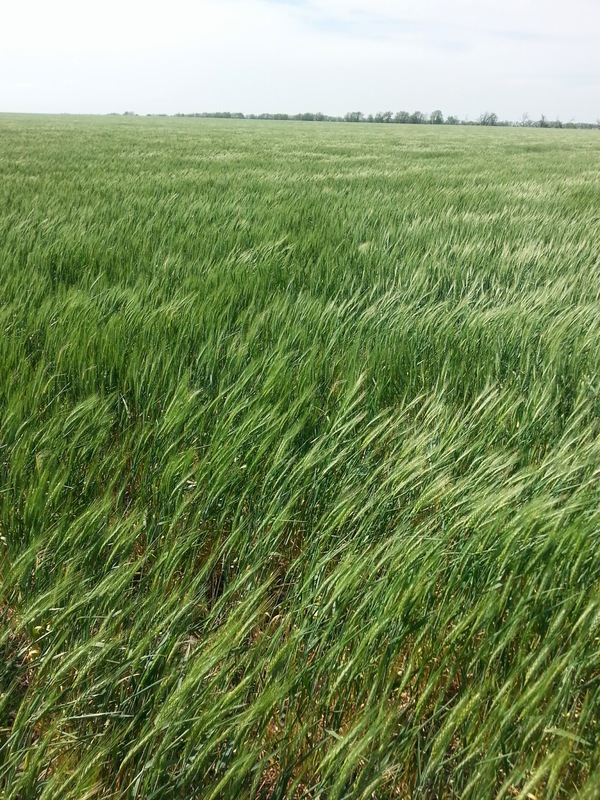 Not many roots on this particular clump of wheat. 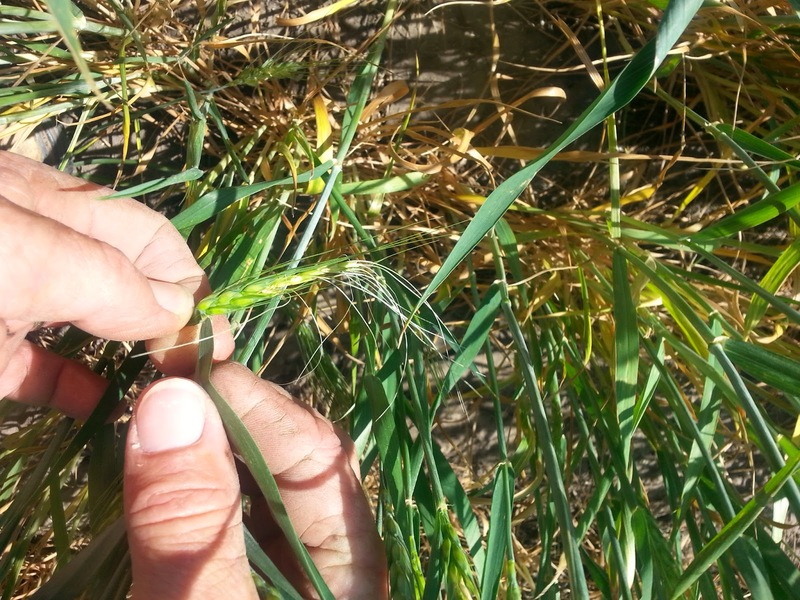 Time to inspect the wheat heads! 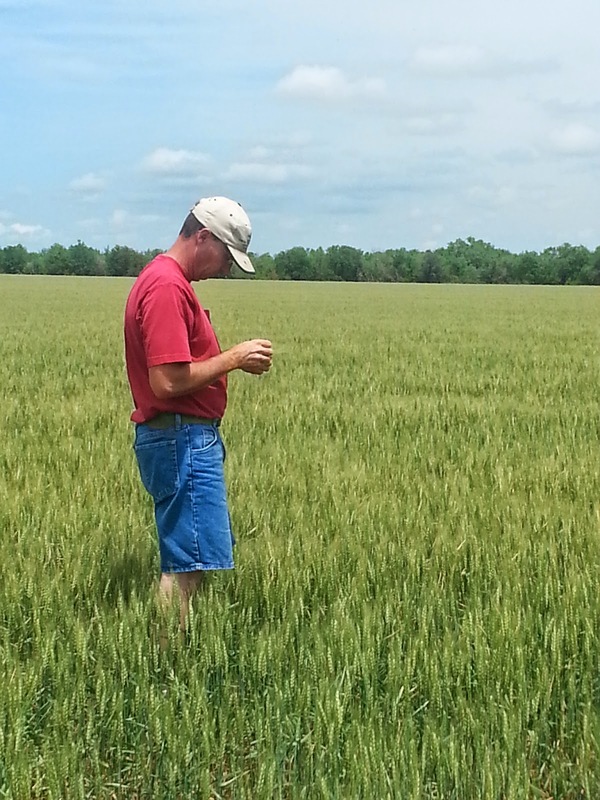 After this wheat crop inspection, we headed over to a field that will be planted to soybeans. We needed to check for moisture. 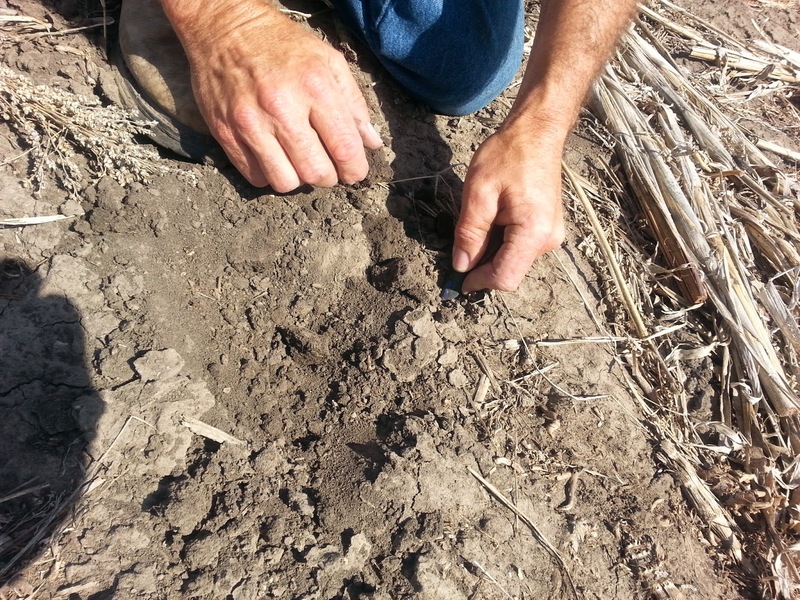 It may not be pretty, but we feel that no till farming is the best practice. That's why it looks the way it does, we do not work the ground between the crop rotations. 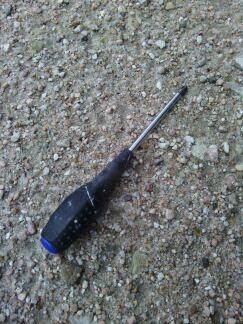 My husband tells me " here, take this screwdriver, we will check the moisture." Yep, you can imagine the look I gave him. he said "or any sharp object will do". Farmers are so resourceful aren' t they! So we proceeded to dig to see how far down the moisture is. We were somewhat happy with our findings on this field. 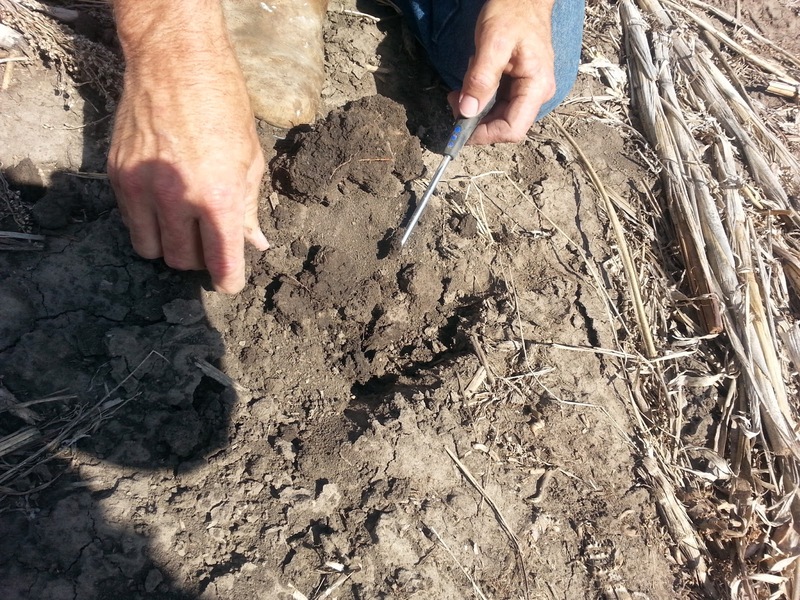 See the darker soil.... moisture. It did rain the night before. At our farm, we got 1/2 inch of rain. We will not complain, we are grateful for any rain that comes our way these days! Our crops depend on moisture! The wind picked up quite abit by the time we reached the corn field. I did not get a photo of the corn field. But we do have some small stalks coming up! I could see the farmer's demeanor change quickly as he looked from the pickup at this field! Here's the issue! In the center of the field, the dirt was blowing alot! There is where Milton had leveled the ground previously since it would not drain properly. With the wind blowing so hard, it could cause the corn to break off. He needed a closer look at the center of the field! So, when we got home, he hopped on his trusty dirt bike, and did what any good ol' boy would do! He drove to the field and did kitty's so it wouldn't blow so much! Perhaps he was just playing as boys sometimes do, or maybe he was blowing off steam, or maybe he was truly helping the corn that was growing I don't know. I will let the farmer be the farmer and I will be the farmer's wife! for our family, and love him as best I can! Last evening I was lucky because I received a "Mom's Night Out". I got to spend the evening with a friend, out and about for a fun night of relaxing! First I have to say, she recommended a great Mexican restaurant. SCORE #1! She also is wise beyond her years, she is the young age of 29. She was giving the 43 year old great advice! SCORE #2! And SCORE #3, of the evening was that we enjoyed the following movie together! 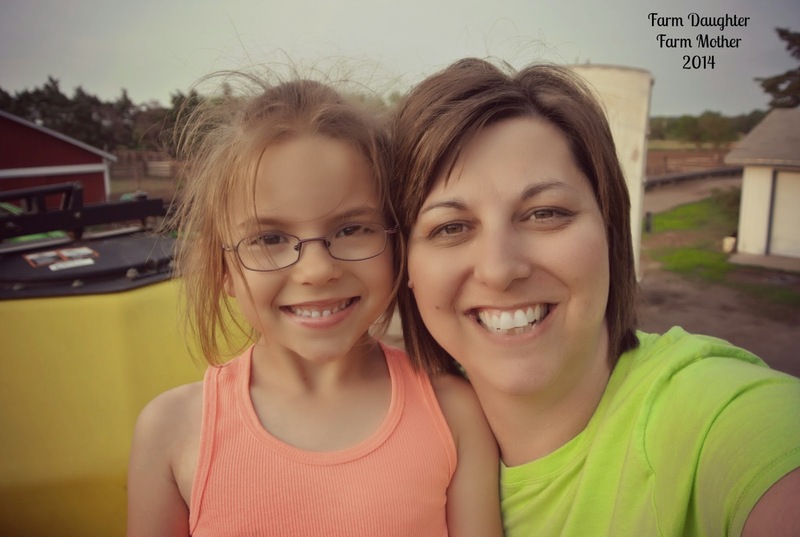 As a blogger and a mommy, I could relate within the first 5 minutes to both aspects! Did I mention laughing yet??? Only to name a few things. There is a scene in this movie (and there isn't a trailer for it, UGH!) where Bones (Trace Atkins) is speaking to Alice (the main mommy character) and I wish I could just freeze it in my mind. Yep it's that good! You have to go see it and stick with the movie, cause about 3/4 of the way through it! Whether you are a stay at home mother, a working outside the home mother, a grandma, a woman, a husband, a male, a friend, whatever you are.... go see it. It will make you laugh! I watched this video today. It stirred something in me. At times, you will find me, just like the people in that video. I am trying to be better about putting the electronics and distractions down. I even bought this book a few months ago. I still haven't finished it. My plan was to read through it and then get serious and do it again. Read it and apply at least some of her advice. I enjoy her blog and posts to Facebook. Although lengthy, they usually have a good reminder for me. Last Sunday, we got to church and I realized I had forgotten my smart phone at home. I didn't have a panic attack, just mentioned it to my husband. He rarely takes his to church you know, he just looked at me and said "you'll be fine". He was right, in fact only one text message was on my screen. The other night I even plugged it in when I got home and totally forgot about it for like 2 hours! I'm trying. It's a start to rid the distractions from my life or at least keep them at bay! 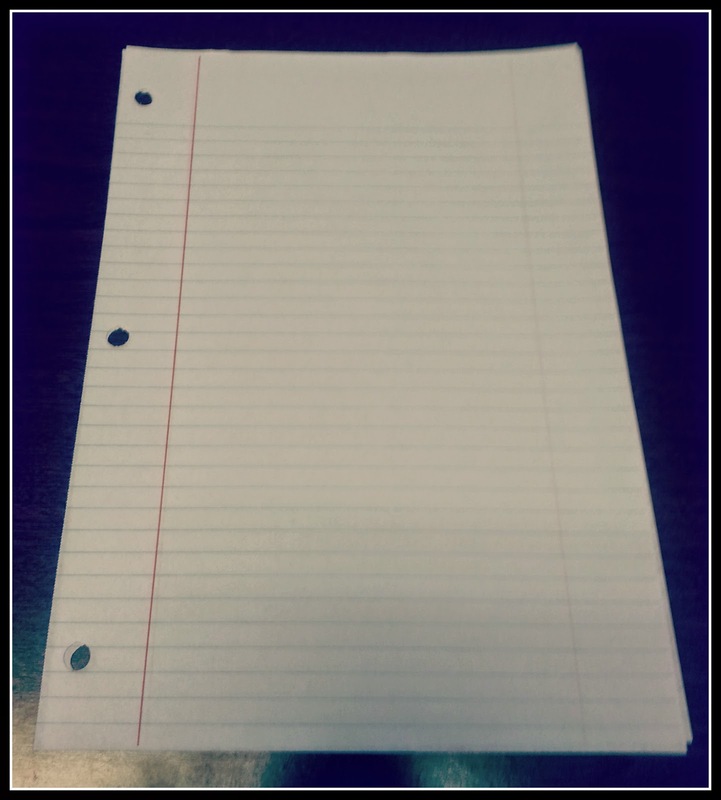 Today I sat down and actually wrote a letter. Not a typed one. A HAND WRITTEN letter. On plain ol' notebook paper! I haven't done that in years I bet! Most of the time it's cards with a little note in it or just a signature, or an email typed out, and if it is a letter, usually that one is typed. All these are great, but there's just something about handwriting a letter. I didn't write a child today, but I did write someone I haven't spoken to, emailed, text, or called in months. We have so much in common, yet our "busy lives" can steal from our relationships so easily can't they? Staying connected with people, whether it's family or friends or acquaintances, is important. Especially these days, because we are spending so much time looking at display screens, typing with our fingers, swypeing on our smart phones, video chatting, or listening to our Ipods. And although most of those things can aide in connection, I do believe we need a deeper connection with others. One that looks at people, speaks to people, visits with people, and reaches out to people. Handwriting a letter gives the recipient so much! Just imagine when they open the mailbox and see an envelope that isn't a bill or junk mail. At least for me, when I see handwriting, especially from those precious to me, it makes my heart fill with warmth. I don't know why, perhaps because they took the time to write slowly and neatly just for me! Do you have recipes that were handwritten by your Grandmother, Aunt, or perhaps your Mother? When you see them, does it bring back a flood of memories, or a peace in your soul that makes you feel loved by them again? Perhaps a letter could do that for someone you know. Sit down, relax, write a few words on a plain piece of notebook paper or a beautiful piece of stationary. Either way, come with me on a handwriting journey. I'd love to hear if you sent a letter or two and how it made you feel! Or perhaps you are the recipient of a handwritten letter this week! Sharing makes life better!